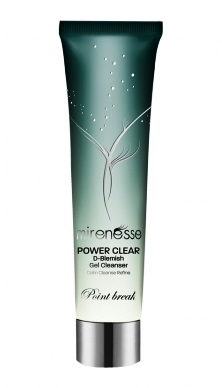 I received this product as part of my December Glam Box from Mirenesse. At first I was a little disappointed because I thought this product was targeted towards blemish prone skin and I am more interested in anti-ageing products. This cleanser in reality suits all skin types and I would thoroughly recommend it to everyone. This is a clear gel that smells like peppermint, it even tastes like peppermint, erm.........I accidently got some in my mouth and was pleasantly surprised. I don't recommend you try this at home. The gel lathers up to a creamy texture, leaves your skin clean, fresh and tingly. What I liked is that I cleansed my face thoroughly it didn't sting my eyes and my skin wasn't dry or tight afterwards. Removed every bit of my make-up and when I went over with a cleansing cloth just to make sure my face was clean the cloth picked up nothing. I have read reviews that this product is great for teenage acne but I think it is gentle enough for everybody. This product is part of a blemish fighting system which includes the cleanser, moisturiser, mask and gel treatment, they contain lots of natural ingredients to gently help re-balance acne prone skin. Ideal for blemished or stressed skin or skin experiencing inflammation and breakouts. Blemishes diminish in as little as 7 days, the longer you use the system the clearer your skin will be. Skin is instantly renewed, refined and clear. I think the peppermint and lavender essential oils help to tone and calm your skin. With my skin type DRY I would not necessarily use all the products in this range but I am now a big fan of this facial wash. I don't feel clean unless I wash my face and having dry skin it is very hard to find products gentle enough that they don't strip your skin of natural oils. I feel this product certainly cleanses your face of dirt and excess oil while the peppermint acts like a natural toner to reduce pore size. The only issue I have with this product is that for a gel it's a little runny and would be better suited if it came in a pump bottle instead of a tube so you have more control over how much product you use. A little goes a long way. RRP $49.50 for 60g. $36.85 for VIP or if your lucky you might get it as part of your Glam Box with 4 other products for $15.